There may have been a layer of unexpectedness which enhanced my enjoyment of this film, but I must admit it was highly entertaining. A little bit of Borat-type humor (“That is so wrong…”), Hot Shots goofiness, and well-planted dialogue combine to make a very silly movie. Hollywood makes fun of itself, on every level, as the plot centers around big budget (and over-budget) action film shoot turned disaster. Rookie director, played by Steve Coogan, struggles to control a roster of varying personalities. Ben Stiller is the pretty boy action star, Robert Downey, Jr. is the extreme method actor with more awards than fingers, and Jack Black is the king of fart jokes and fatty suits. All three have an entirely skewed version of reality, which is counterbalanced by Brandon T. Jackson and Jay Baruchel, as the celebrity trying to prove his acting chops and the newbie looking for a breakthrough, respectively. The five represent the gamut of ‘types’, perhaps even, the evolution of a celebrity and lead the way through film’s quest for footage (literally) and maturity (figuratively). Ben Stiller shares writing credit on this with Justin Theroux and Ethan Coen. It quickly becomes clear which scenes were invented by whom, but the mixture works. Stiller (think Zoolander as “stupid-funny”) seems to rely on the abject absurdity of a situation and Coen infuses the repartee with smart dialogue befitting the characters. Much as been made of two aspects of the film which some find (or fear will be) offensive. Downey, Jr.’s character undergoes plastic surgery so he can play an African-American character. Much is made of this irony throughout the movie and in so doing the silliness of it comes blatant. By taking it to the edge, it reminds the audience of how ridiculous Hollywood can be. A smaller stink was made of the “don’t go full retard” speech. Again, at first glance, it seems insensitive but after thinking on it for a moment it becomes clear that beneath the joke lies a truth that should embarrass the establishment. Yet there are more subtle jabs at the likes of Mel Gibson when Downey, Jr. sheds his disguise and resumes his impossibly blue eyes and Australian accent. 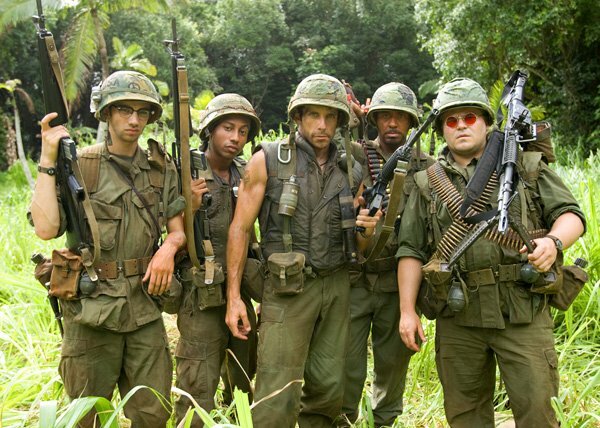 Overall, Tropic Thunder is rife with “I can’t believe they just said that” moments as well as a few highlights from Matthew McConaughey, Tom Cruise (with cringe-inducing chest hair), and Bill Hader. It’s a funny film that should be taken as satire, not as a literal version of what it mocks. Stiller makes the bile rise. I will never be able to get the image of him throwing a toddler tantrum on the set of Zoolander out of my head. I loathe him. But I love Downey Jr and Black, so…I dunno. Choices!